Moses Yangnemenga has been farming since childhood. Growing up in the rural agricultural town of Nandom in Ghana’s Upper West Region, he helped his parents to cultivate groundnuts, beans, maize, millet and sorghum. “Even before you are ten years, you follow your father to the farm and assist with work,” he shares. A MasterCard Foundation scholar, Moses graduated from Ashesi in 2018 with a degree in Business Administration. He knows farming supports families like his across the country. And he believes it can do more. In late 2016, while in his third year, Moses started Tieme Ndo, a project to support low-income farmers in his hometown, Nandom. Tieme Ndo means “push me up” in his native Dagaare language and started with $ 20,000 in funding support from the D-prize. Working with four communities, Moses and his team provide improved seeds, pesticides and fertilizers to farmers on credit. He has also engaged two experienced Agricultural Extension Officers to guide farmers in applying modern, scientific methods in managing their farms. Farmers receive advice on how to plant properly, apply fertilizer, and deal effectively with pests like armyworms which posed a great challenge during the 2017 planting season. Currently, there are over one hundred farmers in four communities within Nandom enrolled on Tieme Ndo. Mr Sylvester Geyire, a resident of the Goziiri Dorupuo community is a beneficiary. “Usually, by the beginning of the new year, the harvest for the previous planting season would have finished”. He adds, “This year has been different. Because of our work with Moses, the harvest was so good that I still have some of my harvest from last year”. Donatus Kpiblu, another Tieme Ndobeneficiary who has been farming for 13 years says he harvested three bags on his one-acre millet farm in the 2016 planting year. Last year, he harvested eight bags on the same plot when he worked with Tieme Ndo– a one hundred and fifty percent jump. In April 2018, just before he graduated, Moses got a further $ 3,000 in funding from the Fund for Service to Children and Youth at Ashesi to expand the programme. The Fund for Service was set up through a grant from the Ford Foundation to support student-centred projects that benefit children and youth. 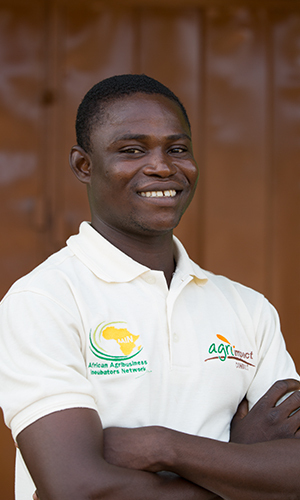 Through the funding he received, Moses has been able to extend the programme to younger farmers in the various communities. Currently, 15 out of the 120 farmers within the Tieme Ndo programme are 35 years or younger. “Moses is an impressive young man,” observes Gregory Lanuzie a 67-year-old man who worked as an extension officer for 32 years. His son, Severo, is one of the younger people involved in Tieme Ndo. “You don’t see this kind of thing happen often; that a young man will return to his community to start an initiative to help his people.” That is what inspired him to come out of retirement to help with Tieme Ndo.